Black Pipe Shelving, Open Shelving Wall Unit, Wall & Ceiling Mounted, Parts Kit "DIY" Black Pipe Shelving, Open Wall Unit, Wall & Ceiling Mounted, Parts Kit "DIY" - 4 Shelves & 10" Deep The shelf boards are not included with purchase only the pipe hardware. The newest industrial urban plumbing pipe interior décor. Great for homes, offices, pubs, restaurants, clothing stores or anywhere that you want to install a true conversation piece with an industrial look. 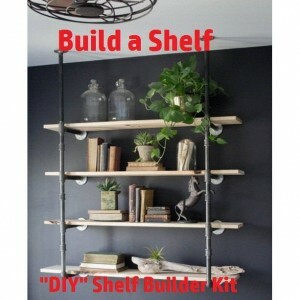 Easy to Assemble There is approximately 12-1/2" in between each shelf. The 4 shelf unit completely assembled without wood shelving weighs approximately 22 pounds. The shelf support pipes are listed by the length of the pipe. Once the pipe and mounting flange are installed the space where the shelf will rest will measure 3/4" - 1" shorter so for example, if you purchase 8" wide shelving they will actually measure 7"-7-1/4" depending how tightly you screw the pipes together (for your shelf to rest on). All black iron pipe and fittings are sturdy 1/2" diameter and can hold up to 200 pounds. Wood shelf boards not included with this listing. Many customers prefer to supply their own shelf boards from a local Home Depot or lumber yard and save on the shipping costs associated with the lumber delivery. The Width of the shelving unit is customizable to your specifications (depends on the length of your shelving). Not recommended over 60" apart without an additional support bracket. Measurements from ceiling to the bottom of shelving unit (approximately 19" to first shelf) and this can modified to fit your needs (modifications may require an additional fee up to 48”). If you only want the shelving unit to attach to the wall (instead of the ceiling mount) we can customize this item to screw only into the wall. Send me a message with your custom request. Measurements are approximate and may vary according to how tightly the pipes are fastened. Easy "do it yourself" project for your home or office. Assembly and cleaning of pipe is required. Mounting screws not included. If this shelving unit isn't exactly what you want send me a message with your idea and I'll try and put together a quote for what you want. 100% satisfaction guaranteed or your money back. Fully customizable shelving support system to accommodate shelving from 16" to up 60". You decide how wide you want the Bookshelf System. If you think you'll need more than 2 support brackets I can customize this unit and listing for you, just ask. You can request custom orders if you need 3 or more support shelf brackets (for extra support for units over 60" wide). Detailed assembly instructions will be emailed to you once you make a purchase. Assembly and cleaning of pipe is required.Please reference the Q & A section in my Etsy shop for instructions on cleaning and more details regarding the black pipe products sold in my store.